Paul Sinha is a Stand-Up Comedian, Presenter and a ‘Chaser’ on ITV1’s ‘The Chase’. Paul is a qualified GP and international stand up comic of many years standing, having performed in all major comedy clubs in the UK, as well as China, Auckland, Singapore, the Middle East, South Africa, Netherlands and Germany. In 2009, Paul was a nominee for the Chortle Best Headliner Award. Since then, Paul has been in great demand, whether on TV shows such as Edinburgh and Beyond, World Stands Up, Comedy Shuffle and Comedy Cuts, on Radio 4’s Loose Ends and the Now Show, or his numerous contributions to Radio 5 Live and Talksport. Paul has taken eight solo shows to the Edinburgh Fringe, his 2006 show Saint or Sinha being nominated for whatever the Perrier Award was called back then. His 2016 show ‘Shout out to my Ex’ had a sell out run and has toured nationally. A quiz fanatic, Paul is often found hosting a long-established quiz in his native South London. Paul was the winner of the 2007 inaugural ‘We Need Answers’ quiz at the Edinburgh Festival, has realised his teenage dream of appearing on University Challenge and Mastermind. With one of the finest quiz brains in the country, Paul Sinha appears on ITV1’s The Chase as a ‘Chaser’. Known as ‘The Sinnerman’, his sarcastic put downs are hard to take even by the toughest of contestants. 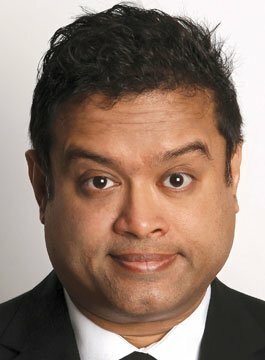 Paul Sinha is a very experienced corporate performer, equally happy to deliver a cracking after-dinner stand-up performance or host awards. Paul’s witty and intelligent brand of comedy is much in demand around the world; on stage, radio and television. “Superlative... irresistible... jokes come thick and fast." “A tour de force of humor and insightful observation"